Home » Blog » How Can Tool Integration Warrant a Successful DevOps Initiative? With the rising stakes of continuous software delivery as a strategic business initiative, millions of dollars are being invested in DevOps initiatives within software organizations. While, in theory, DevOps should increase the speed, quality and transparency of your delivery processes through enhanced collaboration between various disciplines and work groups, real process improvement and return on investment from DevOps initiatives have been difficult to come by. One of the major barriers to DevOps success can be siloed teams, processes and tooling across the application delivery lifecycle, which make it difficult to trace and automate the flow of work, and optimize the delivery pipeline. You need to connect all your teams, tools and processes into end-to-end workflows with complete visibility, traceability, and auditability. In this article, we look at the importance of tool integration in improving DevOps performance, some of the key challenges in achieving end-to-end integration and how to address them. In a software development organization, the value stream refers to the series of steps that provides a continuous flow of value to the customer, covering the entire development to production process. In an ideal scenario, your DevOps tools should function like a series of stepping stones that help you reach the ultimate goal of delivering new functionality into the hands of your customers ever faster and ever more frequently. The main sticking point is managing the wide range of tools that organizations typically rely on to achieve a continuous delivery and continuous innovation lifecycle. DevOps initiatives often start as a series of experiments where tool choices are geared towards addressing immediate requirements, which cover disparate facets of the DevOps process — rather than a shared tools strategy. This approach results in tool duplication and leaves various functional gaps (like metrics gathering, operations activities, and security requirements) as tool vendors extend their tool capabilities across the delivery chain. Each tool category plays an essential role in handling specific areas of the software delivery process, fixing disparate problems or automating disparate tasks like CI, testing, or deployments. The result? A fragmented value stream where each phase evolves into its own silo of teams, processes, tools, and data that are not fully integrated with the rest of the phases. For instance, if your agile planning and requirements management function is isolated from the rest of the value stream, it becomes a black hole of activity and often a bottleneck to delivery. You cannot keep track of where your user stories are deployed, what tests have been done and what are the results. Unless your DevOps tools are integrated, and workflows automated, it will be difficult to get the much needed big-picture view of the software development lifecycle and optimize the value stream to sustain and scale your DevOps efforts. The IT organization will remain bogged down by endless spreadsheets, emails and copying and pasting of data between systems to sync up statuses between teams. It is not only highly inefficient and error-prone, but also makes it impossible to competitively deliver business value to your customers at scale. You need a rapid, reliable, and low-risk integration process that brings together the disparate tools covering various aspects of the overall process, so they can function together as one cohesive unit. However, the promise of end-to-end integration and visibility in the software delivery process has proven to be difficult in practice. Too many tools, too little time: For several organizations, the need for greater speed has resulted in the rapid proliferation of rogue tools and fragmented data. Over time, the array of tools gets so huge and complicated that it starts paralyzing teams and impacting productivity. With enterprises using so many tools, and even multiple tools within the same category, point-to-point integration does not remain a viable option any longer. The number of P2P integrations needed to connect a given number of components increases exponentially as additional tools get added to the DevOps toolchain. Such integration becomes too brittle and damaging to both the IT budget and the organization’s ability to scale automation workflows and meet current and changing business demands. From on-prem to the cloud, and hybrid: With cloud technology permeating the enterprise, the entire DevOps process itself can now exist on premises, in the cloud, or in hybrid configurations. How can you ensure fast development and rollouts of new functionality into the hands of your customers, while supporting modern cloud and hybrid models for applications and data sources? There’s a lot to juggle, and it isn’t easy. Your DevOps tool integration strategy must therefore be flexible enough to support the myriad challenging requirements of modern, hybrid environments and make you feel empowered in making your own technology choices. Decentralization without oversight: The need of the hour is a decentralized model that enables users to carry out their own integration tasks in order to support high-velocity IT projects and sustain innovation. However, this comes with significant security, governance and compliance risks. As industry experts attest, it is not easy to create a capability that fosters rapid integration at the speed and scale of DevOps while at the same time ensure regulated control in the process as a means to mitigate risk and uncertainty. There is an urgent need for an efficient, scalable, and agile approach to integrate and control all assets. 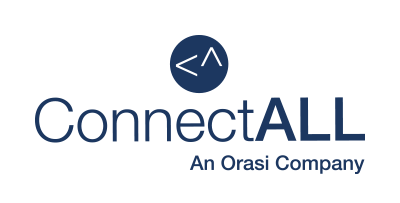 ConnectALL is a leading enterprise application integration platform that brings together your teams, processes and tools, fostering coordination and shared knowledge across the DevOps toolchain to bolster your continuous delivery lifecycle. With the help of a codeless configuration facility, it drastically reduces the complexity of integrations and allows users (Developers, QA Managers, IT Ops, or Service Managers) to perform their own integration tasks, while also maintaining centralized governance and control. Once your teams, tools and processes are integrated, you can easily identify and address redundant processes and non-value added activities and enable value stream management of a connected end-to-end application lifecycle, leading to greater business agility. If you want to delve further into how integration can enable agile development, deployment, and innovation or elevate the value of DevOps initiatives that were stalled and blocked, just drop us a line at marcom@connectall.com.